Another lovely day at Who Do You Think You Are? Live, our journey being made easier with the absence of the trolley. I do another stint as an expert waiting to be asked. I am somewhat hampered by the computer, that to all intents and purposes is attached to mains electricity, dying for lack of battery. The brick walls come in thick and fast. I field questions about ancestors with three ‘wives’, potential Dutch immigrants, connections to Irish film stars and disappearing Scottish grandmothers. Tickets for my talk have sold out by 10am, unfortunately my voice has given out too. Studio 3 involves competing with a great deal of background noise and a PA system that means you can’t actually hear how loud you are speaking. Nonetheless I manage to croak my way through my ‘Putting Your Ancestors in their Place’ talk and appear to have won some converts to the excitements of one place studies. I just hope that people don’t think my voice always sounds like a strangled frog. In the general enthusiasm I mange to pour a cup of water over something that looks suspiciously like some vital electrical connection. That would be because it was a vital electrical connection – not a good move but I seem to avoid electrocution. Books sold we head back to the van. We have scrounged a trolley, a more substantial affair than our wheel-less version. Security turn out in force and try to prevent us leaving not, as last year, because they think we are breaking down a stand early but because trolleys are not allowed in the exhibition area whilst the public are still on the premises. I fail to see how a trolley is any more lethal than a buggy or wheelchair. We are escorted the twenty yards to the door and escape. The only way to get the boxes and trolley over the footbridge is to take the boxes one at a time. We ignore the tannoy’s exhortations not to leave parcels unattended and hope for the best as we play put and take with the boxes. Two kind gentlemen assist us. We are happy to surrender boxes containing hundreds of pounds worth of books to complete strangers, safe in the knowledge that no one will run off with them. In fact it is difficult to do much more than stagger drunkenly carrying a box of that weight. They can barely lift them from the ground let alone make a quick exit with one under their arm. 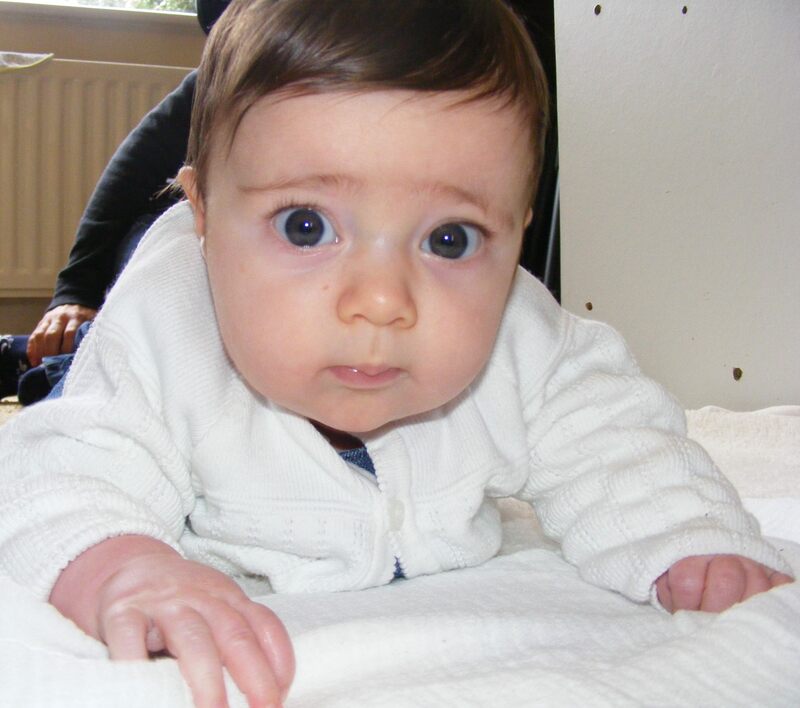 The next day a surprise visit (well I was surprised) to see my number one granddaughter and her lovely parents. This required us to drive through the Blackwall Tunnel. I am really not a fan of tunnels, although I cope fine with the underground. I manage to avoid a panic attack and we arrive at a new road layout near Kidbrooke. With no apparent prior warning we are met with a choice between driving down a bus lane or driving through a portion of road with a seven foot width limit. Remember we are towing a caravan. To make matters worse the seven foot wide section is not even straight. Always law abiding, we do not take the bus lane. Chris subscribes to the view that if his extending wing mirrors fit through a gap so will the caravan (isn’t there a similar theory involving cat’s whiskers?) Bit of a shame then that the caravan turns out to be seven foot one inch wide. Actually, thanks to a combination of Chris’ superior driving skills and inaccurate measuring on the part of the sign writers, we pass through the gap unscathed but it was a very close thing. Miraculously, the television that failed to function yesterday is now working. This seems to be because we have turned the aerial off – ours not to reason why. We set off for our first day at Who Do You Think You Are? Live. I cannot believe that I have neglected to bring any gloves for the long walk from caravan site to station. I wear gloves nine months of the year, what can I have been thinking? I am attempting to look vaguely smart, always an effort, so am sporting a new velvet jacket (once a child of the seventies…..). The downside of this is that I can’t carry the heavy lap top or bag over my shoulder without ruining the jacket. It appears that our trolley full of boxes of books will fit through the automatic barrier. Appearances can be deceptive and we get stuck with an alarm sounding. The trolley full of book boxes does not go down well with our fellow travellers either – well it is a commuter train. Disconcertingly the scrolling information in the train reads ‘we are now approaching Crystal Palace’ for the entire journey. Well, I hope not as we have just come from there. Ah this appears to be not Crystal Palace but Clapham Junction. We are warned of the VERY big gap between the platform and the train. They are not wrong. My partner in crime manfully hauls the book laden trolley across the gap. I can see that I am going to have some serious grovelling to do in gratitude. Once at Olympia we catch up with friends. Very excited to see Putting Your Ancestors in their Place in print for the first time. I spend a couple of hours in the speed-dating scenario that is the ‘expert’s’ table area. The venue is about fifteen degrees warmer than it was last year; pity I have dressed for last year’s temperature. I hover outside the Celebrity Studio in good time for my presentation; that would be in VERY good time. I am following the keynote slot. 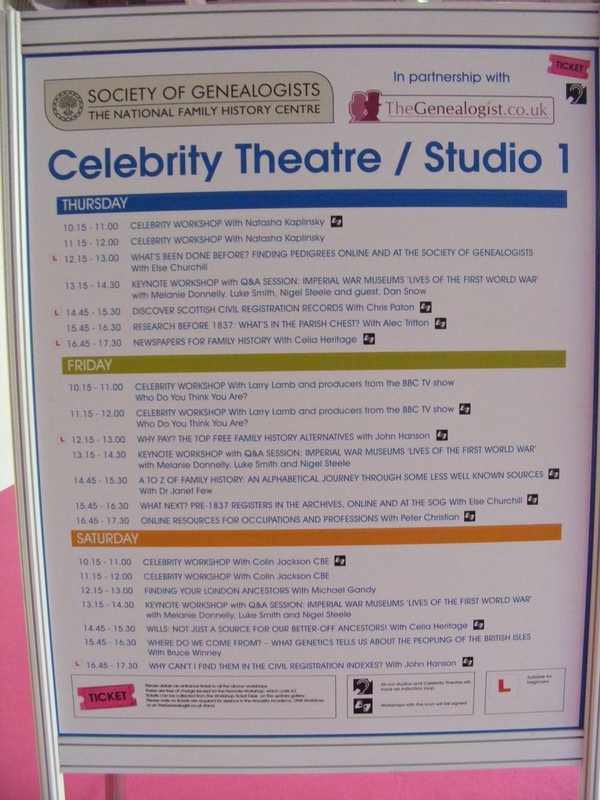 The Celebrity Studio is only half full for that session so I am not expecting much of an audience for my own. Far from the crowd thinning as I expected more and more people pour in until there are very few empty seats. This may be because half the audience are desperate for somewhere to sit, undaunted I deliver my A to Z of sources presentation to the assembled throng. Speaking from the Celebrity Stage seems to involve staring into very bright spotlights. I am still wondering quite what I am doing in this arena – I am sure it is a mistake. Nonetheless I was pleased with the reception and there were some embarrassingly effusive comments afterwards – what lovely people. They even bought a box and a half worth of books – even better. Chris bravely juggled books, change and handouts whilst I devalued people’s purchases by signing them. Then time for the home journey. Even on the platform people are approaching me to say how much they enjoyed my talk. Regular readers may remember that last year there was an incident when the wheel fell off the book carrying trolley. As we alight at Clapham Junction I notice that the trolley again has only one wheel. Even I know that this is one too few. Spectacularly, this time not only has the wheel fallen off but it has found its way on to the railway track. An obliging member of staff stops oncoming trains whilst he fetches a ‘picker’ to retrieve our wheel. The crowds on the platform opposite are hugely entertained by the proceedings. Now to affix the wheel back on to the trolley. Last year I conveniently had a nappy pin about my person (best not to ask), not so this time. We scour the station for a suitable metal spike like object in vain. Transport for London have done a great job on litter collection. So good in fact that there is nothing lying around that we could utilise. We somehow manage to keep the wheel in place without the aid of a split pin substitute and board our second train. Chris is eyeing up the fellow passengers to see if any look like they may have a handy spilt pin, or something that could be used as such, about their person. A lady with earrings that are adorned with large metal spikes is attracting his attention. We reach Gypsy Hill. Clearly the whole world lives at Gypsy Hill as the train empties rapidly. A final departing passenger has her hair restrained by hair grips. Well she HAD her hair so restrained until Chris persuaded her to donate one to the cause. In the unlikely event that you are reading this Madam, you can probably dine out for months on the story of the strange people that you met on the train but thank you very much. Sadly the hair grip does not last long and the wheel is again at serious risk of imminent departure. We manage somehow to get to Crystal Palace with two wheels not exactly intact but at least not in danger of being flattened by a train. I elect to sit with our possessions while Chris goes for car. That would be fine except that there are no seats. Maybe no one has come up with something sufficiently vandal proof for the populous of Crystal Palace. Our reputation has obviously preceded us as the station is crawling with police. It seems they aren’t looking for people who rashly attempt to get wheel-less trolleys on trains. One individual is sporting a high-viz jacket with ‘Revenue Protection’ on the back. What ever they are expecting does not materialise whilst I am waiting for Chris to return with the car. I return to find that the Twittersphere contains numerous references to Putting Your Ancestors in their Place – aren’t people great. A lovely day and tomorrow we do it all again – minus the trolley. The excitement of setting off for Who Do You Think You Are? Live was delayed by waiting for the electrician to ‘first fix’ the conservatory. Odd term ‘first fix’, surely something is either fixed or it isn’t. He was due last Friday but the lack of a conservatory roof at that point made playing with electricity less than desirable, especially as the rain was still of biblical proportions at that point. Very shortly before last Friday I realised that in order to be ready for the electrician I should have purchased the necessary wall lights. No spare days for a trip to the shopping metropolis that is Barnstaple so I relied on online outlets. Plenty to choose from and I found some that I liked. In fact I liked them so much that I bought some to replace the wall lights in the living room as well. I suppose the clue was in the brand name ‘Massive’ really. I had thought that it was just that – a brand name – unfortunately it was a descriptor. It never occurred to me to look at dimensions, supposing there were any. I now have four seriously oversized wall lights. On the grounds that I can’t be bothered with the hassle of sending them back and finding something else I shall use them, even if it makes me feel like Alice in Wonderland after she’d drunk the shrinking potion. Then the car journey to London. There is a vent in the car door that blows cold air on my knees regardless of any fan and heater settings. The equivalent vent on the driver’s side doesn’t appear to work (or malfunction) in this way. After several journeys I have now worked out a solution that involves wedging magazines in front of the vent. This is fine until you open the door BEFORE removing the magazines, which then fall out of the car into an inevitable puddle. The Twitter-sphere informs me that there has been an earthquake at home. It is apparently the 5th strongest English earthquake of the twenty first century – not actually sure that that is much of a claim to fame. Typical though that things get exciting when I am not there. All I can say is that if my conservatory has been knocked down by the aftershocks someone will suffer! We know we have arrived in London as eccentricity rules. Some of the inhabitants even make me seem normal. As we drive through Wandsworth (I think it is Wandsworth – looks pretty much the same as other London boroughs on our route) there is a man walking along with a paper bag on his head. It is one of those sturdy paper bags with a bottom and handles. He has cut eye holes but the bag is otherwise undecorated. If he is trying to be inconspicuous he has scored a major fail! Huge excitement amongst the Braund research team. 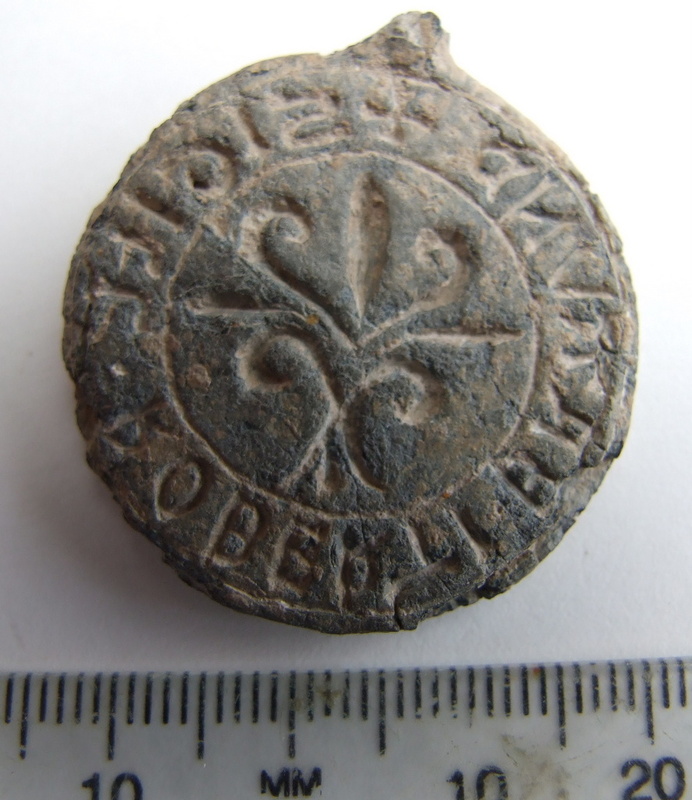 A metal detectorist has turned up a Medieval seal near Stokenham, Oxfordshire. In case you’re wondering – not the carcase of a cute furry mammal but a document seal. Said seal is inscribed ‘Robert Braund’. Although Braunds are predominantly a west country family from the 1400s and earlier references are in Lincolnshire, we do have a Robert Braund who owned land in Stokenham in the 1250s – amazing. Finds such as this appear on the Portable Antiquities website, definitely worth a look. Blogging has taken a back seat whilst I give and prepare a number of talks, including those for Who Do You Think You Are? Live at the weekend. I have agreed to meet up with so many people that I just hope I have time to give the talks! I have already taken my first booking for 2015 – get in early to beat the rush I say. The annual march to commemorate the English Civil War Battle of Torrington has come and gone. Fortunately we avoided the worst of the bad weather. I elected not to drum this year – one can have too much of ‘The English March’. I have learnt that keeping a low profile and avoiding press photographers is impossible when one is standing by someone who looks archetypally seventeenth century. Even the photographer said to my companion, ‘Didn’t I take your picture last year?’ On the subject of bad weather we have remained if not exactly dry at least not flooded. The building work was ‘winded’ off a couple of times but I now have a functioning letter box again and the conservatory has a roof. Still quite a bit of internal work to be done but I am getting there. I am now the proud possessor of 16 boxes of Family Historian’s Enquire Within so you may purchase them directly from me if you like – or even if you don’t – I rather need my house back. I will have some for sale at Who Do You Think You Are? so stop me and buy one – or two. I have to lug these best part of a mile to the station each day so could do with not having to take too many home again, especially as I am bound not to be able to resist the temptation of making book purchases of my own. I have been thrilled by the response from ladies wanting to take part in my 1946-1969 memories project I anticipate that the last few spaces will go at the weekend and we will start soon afterwards so get in touch soon if you would like to join in. My recent introduction to Google+ inspired me to attempt a family hangout. My granddaughter was singularly unimpressed at being dangled in front of the camera so she could participate – made more difficult by the fact that her mother was making contact via a phone. It is the next best thing to being there though, so I hope that we can do it again and I have visions of reading stories via Google+. An impending computer disaster is the imminent demise of my apostrophe key. I am a bit of an apostrophe fiend and have been known to boycott businesses advertising potatoes’ or vacancies’ so this is serious. It of course shares a key with the @ symbol. The lack of an @ could cause difficulties too. A great week on the community history front. I spent yesterday presenting my day course ‘Researching Your Ancestors and their Communities in the Early Twentieth Century’ to an enthusiastic group of students. There are some major events coming up on the presentations calendar. I was excited to be asked to lead a remote workshop on North Devon emigrants at the forthcoming British Isles Family History Society of Greater Ottawa conference. I just hope that the technology is kind to me. I am grateful to Buckinghamshire Family History Society who were very understanding about rescheduling my appointment with them so that I could do both. First though Who Do You Think You Are? Live next weekend. 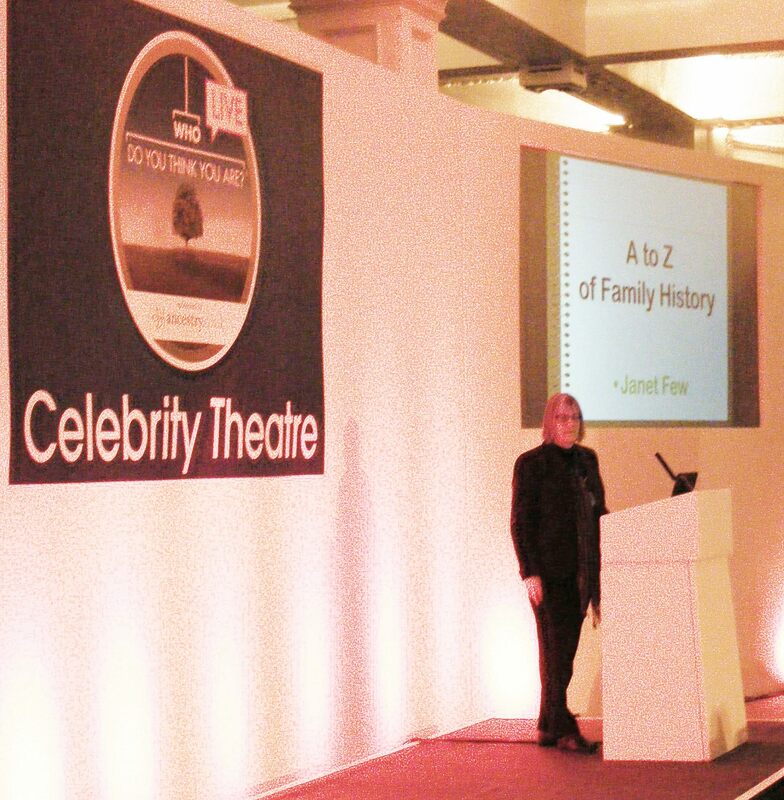 I have only just registered that my ‘A to Z of Family History’ talk, designed to tie in with Family Historian’s Enquire Within, has been scheduled for the celebrity studio and will be accompanied by signing (as in sign language – although I will sign books too if asked – in fact I’ll sign pretty much anything). Not that I think I am in any way a celebrity – there was probably nowhere else to put me but wow! Next thing we know I will be asked to take part with other non-celebrities in reality TV. I was also excited to see that the Institute of Heraldic and Genealogical Studies had made Family Historian’s Enquire Within book of the month. I hope I will be able to catch up with some of my family history friends over the weekend, I am there Friday and Saturday. 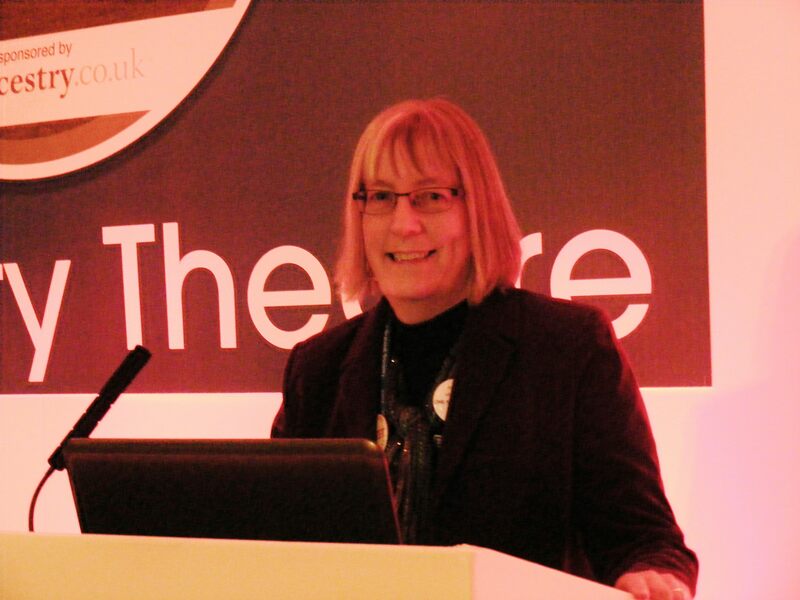 11.00-13.00 each day I will be found in the ‘ask the experts’ area – not only a non-celebrity but also an ‘expert’ – what a lot to live up to. 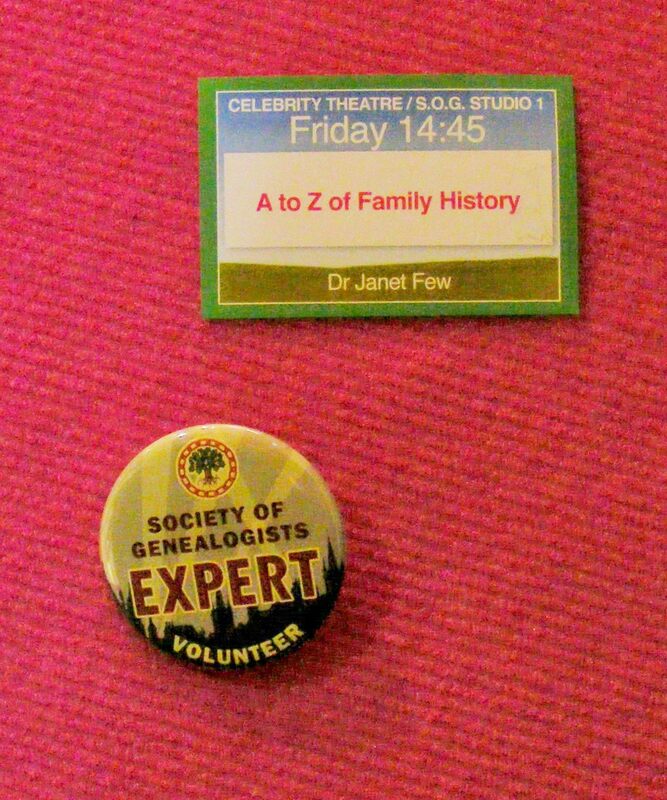 Friday at 14.45 I am – whisper it quietly – in the celebrity studio and Saturday at 15.15 I am in the more lowly studio 3 talking about One Place Studies and promoting my other new book Putting Your Ancestors in their Place: a guide to one place studies after which I hope to get together with other one placers. I need to sell some books otherwise we have to work out how to get 10 boxes on two London trains and up a half mile hill to the caravan. The rest of the time I will be chatting to people and trying to resist the temptations of the book stall. I still have some of last year’s haul to work through. I am thrilled by the continuing response to my 1946-1969 project. Janets have been flocking in and now outweigh the Lynnes, adding weight to the theory that everyone of a certain age is indeed called Janet. In between the history I have been planning our summer holiday in Scotland. Look out frozen north here we come. Plenty of countryside, islands and heritage and as few cities as possible, apart from two days at the Commonwealth Games. 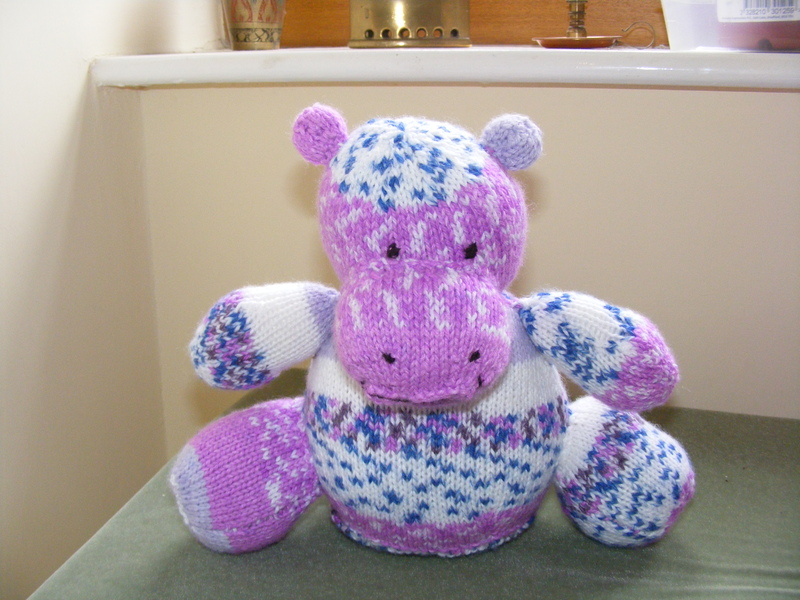 The latest grandmotherly crafting project is a knitted Hippo in rather a natty rainbow wool. She is now awaiting the arrival of her owner next month, or if his mother is to be believed, rather sooner than that. 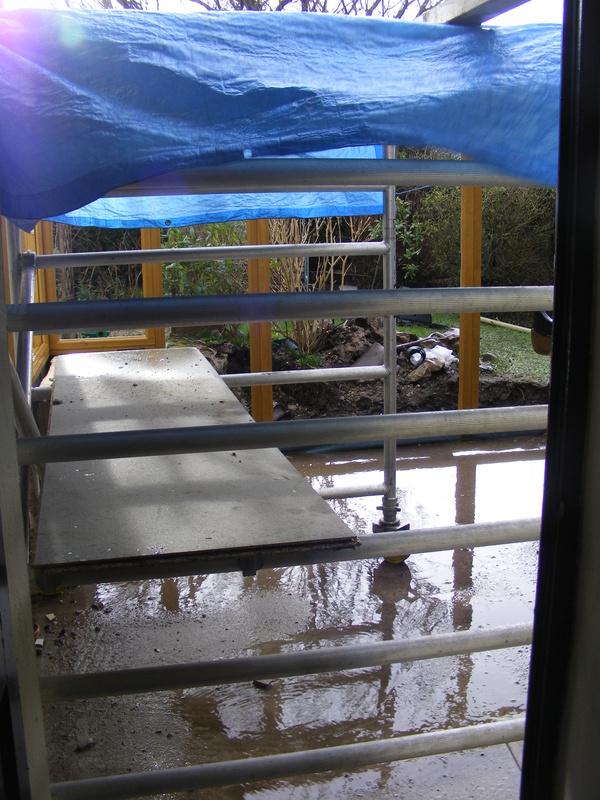 Oh and thank you for asking, the porch and conservatory building has recommenced after a week’s break. Both now have window frames but I am unable to use my back door. I am fortunate not to have suffered as badly as many of my west country neighbours but it is rather disconcerting sitting in a force 10 gale with tarpaulins flapping, loose drain pipes rattling and scaffolding creaking. What an amazing response to my request for women willing to share their memories of post war Britain. Thanks to the power of social media, I have had 500 hits on my website in 48 hours, several new followers – who may not be aware quite what they have let themselves in for – and willing, enthusiastic volunteers. I still need more and will be seeking to address the sample balance that currently favours those from the south-east. Strangely a third of my volunteers are called Lyn/Lynne/Linda and there’s me thinking everyone of my generation was called Janet! Partly in order to come up with a snappier title for the project (and eventual book) than 1946-1969, I have asked volunteers what epitomises that era for them. Many have made references to freedom and rebellion, alongside family security. I can’t wait to get started. I have been diverted from my immersion in the 1950s and 1960s by the need to put the finishing touches to my day course on early C20th family and community history, scheduled for Friday. A fair chunk of this relates to the first world war so it was good to take part in the Society for One Place Studies’ Hangout on Air on researching communities in world war 1. The building work has ground to a halt whilst the brick work dries out in preparation for the erection of the glass bits. ‘Dries out’? Has anyone looked at the weather forecast? Mature fishermen of my acquaintance are muttering that they have never seen such high tides. 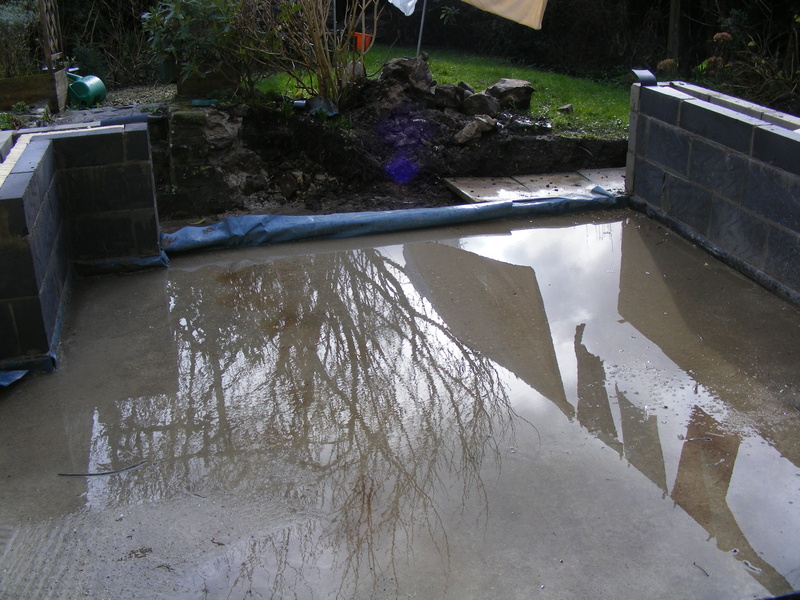 The swimming pool that will one day be my conservatory floor now has a deep end and a very deep end. You can see wonderful reflections of trees and yes I even managed to dodge builders and rain to get the washing out. The lack of a letter box (yes I know I have mentioned this before) has proved troublesome. This week I retrieved my post from various puddles and drains down the road when the temporary post box blew open and the contents blew out. I am now drying my train tickets to get me to Who Do You Think You Are? Live and my Race for Life sponsorship form on the Rayburn. Those of us who are currently dwelling on the post war era are recalling that women of the time knitted and sewed and generally made things. 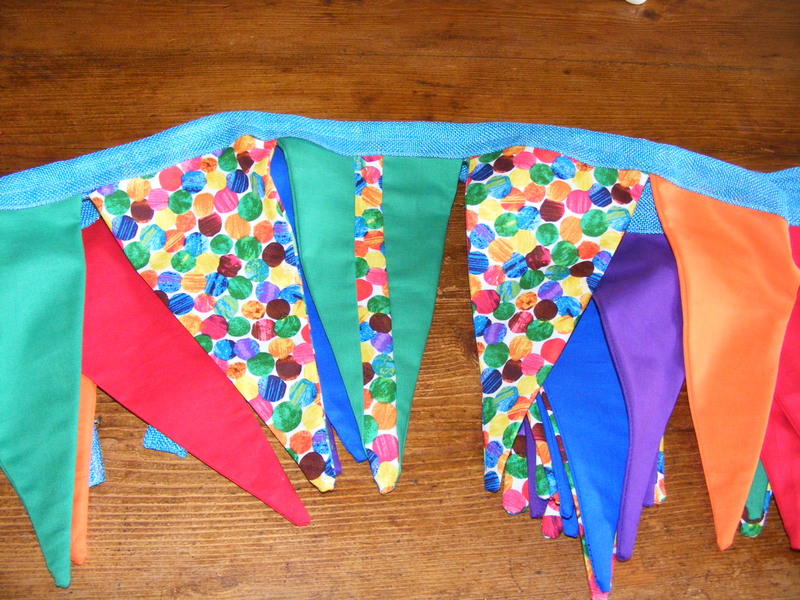 Grandmotherhood has done something to reawaken my latent (and they are pretty well buried) craft skills. I can knit reasonably well but apart from an annual village sponsored knit (strictly squares only) I haven’t knitted for decades. I may have been somewhat put off by creating, at great personal effort, an arran jumper for a boyfriend who then promptly departed the scene. 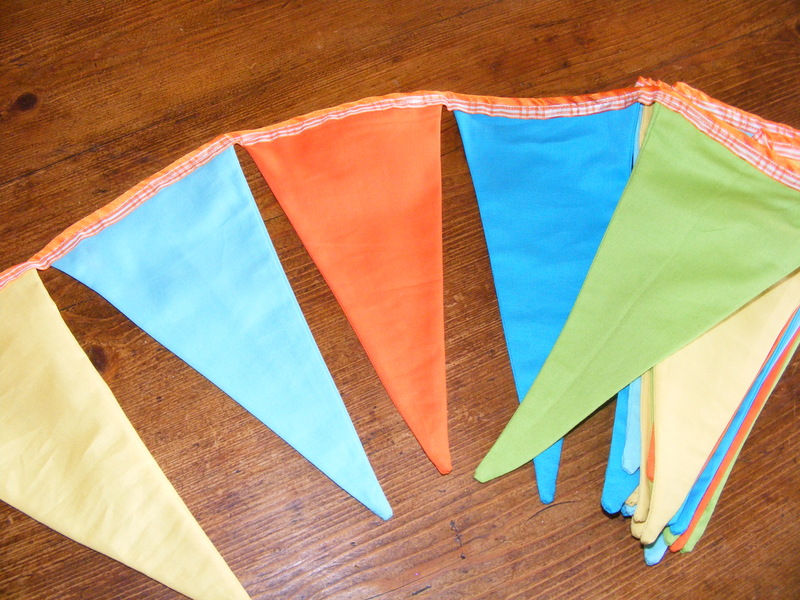 So far I have produced two sets of bunting (not knitted – that would be weird), which seem to have turned out ok and one set of booties, oh and a knitted hippo. 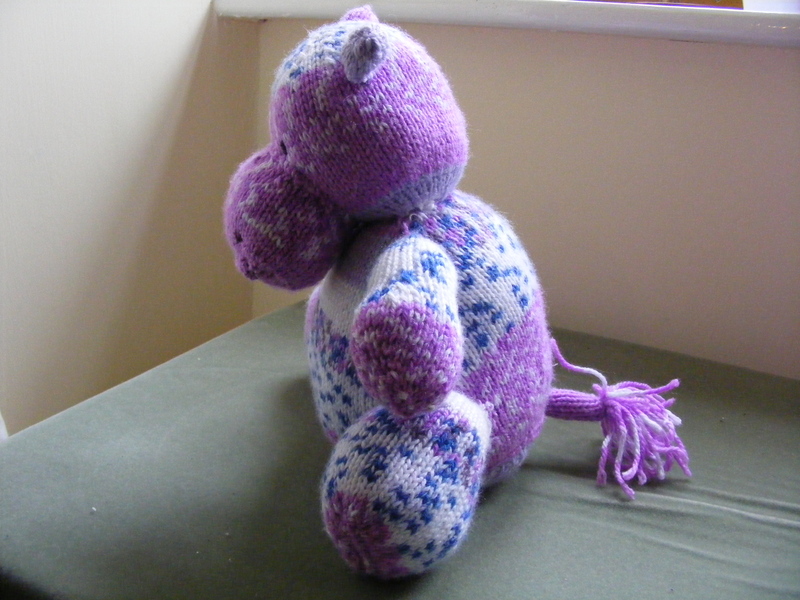 Well, the latter is still in pieces and the instructions for sewing various parts together are a little unclear but it may turn out to look like a hippo in the end. With this in mind I went to order stuffing via a well known online retailer. I found 1 kilo for £6.49. The same make was available at £5.99 for 2 kg – looking like a no brainer. Then I spot that 4 kg of the same product is £6. I hesitate to order 4 kg, this stuff is pretty light, just how big is 4 kg going to be? I have been caught like this before. When I first left home I bought bacon and was blissfully unaware of just how much bacon weighed. I can’t remember how much I purchased but I did have bacon three times a day for a very long while.